More people are retiring earlier than ever before as the baby boomers reach their retirement range. The number one problem that almost all retirees have is no long term goals. You’ve planned all your life; planning in your job, saving for your kid’s college funds, saving for your retirement, and dreaming of vacations from time to time. Planning is a part of our lives and yet when we retire, we are at a loss of how to use that unstructured time that we wanted so badly but now have an abundance of. A new article was just written on the six phases of retirement and it was exactly what we have experienced after we sold our business, Playful Pooch Dog Daycare. It often takes someone years to adjust to this new way of life with few routines, and it took us exactly three years to the day. 1) Planning for the Long Awaited Goodbye. Most people start their first job with excitement and enthusiasm but before long are wondering how many more years they have to drag themselves to work early every morning. I started saving when I turned 45, putting $200 a month into an automatic investment plan when the market was on fire in the 90’s. My savings grew quickly while both Will and I saved the maximum amount we could through our IRA’s since we were both self employed. We were planning for the big day. 2) The Big Day. This day is almost like how you feel at your wedding, celebrating with family and friends, your employees and customers. Everyone is shaking your hand, high-fives all around, hugs and kisses, a feeling of relief and euphoria surging through your body. 3) The Honeymoon. Sleep in late, catch up on the news, lounge around in your pj’s and leisurely go through your day, no rush at all. Buy a second home, spend a bunch of money fixing it up, and take a “honeymoon” trip. Then look at your savings balance that just dropped like crazy within the first six months. 4) The Letdown. 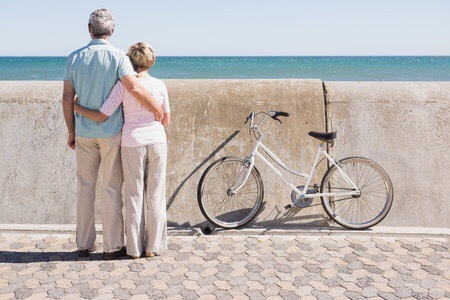 “So this is it?” many retirees lament, and it’s very similar to how newlyweds feel once they get down to living their ordinary day-by-day lives after being caught up in a year of whirlwind wedding plans. Many retirees are lonely and isolated and depressed with no groups to belong to, or meetings to rush off to. 5) Create a New You. Your identity has always been wrapped up in titles like, mom, dad, husband, wife, teacher, banker, group leader, manager. While some may still apply, the job title is gone and you feel lost without it. That was the one thing that kept you going to work everyday, the paycheck of course, but a chance to talk to your friends around the coffee pot in the mornings. Early retirees are overwhelmed with feelings of not being worthwhile any longer, their purpose in life is gone. What helped to define their very core for 40+ years has slipped away. They must move on and create a new identity, something different than in the past, something more vibrant and new. 6) Routine and structure. We lounged around way too long, drifting through our days with nothing to do until the grandkids came over to play with us. It’s been three years since we sold our business and it felt like a roller coaster of emotion, the peaks and the valleys along the way. We now have settled into a comfortable daily routine of golfing and swimming to stay fit. I take art classes and cooking classes to stimulate the creative side of me and I recently started up my consulting business again to keep my brain from turning to mush. The ability to move through these emotional phases and find a way to balance both your wants and needs is critical to enjoying the “golden years.” Ongoing financial analysis is critical to allow for a comfortable lifestyle and the freedom to pursue new and exciting hobbies and skills that you never had time to do while working. Great post! I’m at a point where I can see the finish line in the distance but am already planning and looking forward to it. Just don’t do it too early. We really had a hard time after the honeymoon was over! Check out my other blog for stories about all the dogs we’ve ever loved and those we’ve never met!